Scammers, Frauds, and Thieves Oh My! The world wide web is fraught with an endless supply of theives, scammers, phishers, malware, viruses, and outright fraud. Websites run by owners and sometimes hackers with nothing but the foulest of intent literally sitting around waiting for the unsuspecting to stumble upon their page and be suckered in. The list of websites to avoid grows at a staggering rate and even when a fraudulent website goes down it seems that two more pop up to take its place. What the web needs is a good dose of pest control and some international laws to put these people behind bars. But until that happens your best tool in fighting the online scumbags is a little dose of common sense and some research. That having been said I voluntarily let myself be exposed to one of these online operations so you all can see the dirty underbelly of the beast. If you think you don’t need the lesson I hope you trust your credit card company and have plenty of money to burn. The buying habits of most consumers out there are controlled by ads and of course desire. So we see a product advertised and naturally compare it to what we already have or don’t have which results in desire. For me personally I had a desire for a good digital camera that has some of the features of a DSLR but without the associated weight. I wanted a point and shoot with the quality of a DSLR, the ability to add a flash, and the movie capabilities of a good camcorder. I narrowed my choices to just a few among which was the Canon G10. With my candidates selected we proceeded to the next step. DISCLAIMER: TechwareLabs does not endorse any of the following websites and does not suggest in any way that you purchase products from these websites. Any loss of money or compromise of your credit information is not the responsibility of TechwareLabs. This article is intended for informational purposes and to help you avoid financial and data losses. Now the differences in price between Newegg and EliteCamcorders was huge, especially when you look at the higher end camera the D90. As I personally don’t know of anyone willing to burn $100 let alone $340 for no good reason I quickly gave EliteCamcorders a call. After waiting on hold for a sales representative for five minutes I was assured that both the G10 and the D90 were in stock and ready to ship. I was also told that if ordered on a Monday I should receive the camera on or before Thursday. Since I really only wanted a portable camera (and this was an excerise in Bait and Switch) I selected the cheaper Canon G10. The camera was ordered on a Friday at 1:25PM, by 1:31 I had an e-mail confirming my order and telling me I needed to call them back to “confirm” my order. I found this a bit unusual as I had never had to call to confirm an order before. And here is where out online experience takes a turn for the worse, much worse. Before I tell what occured it is important to explain the tactics behind bait and switch. Basically a retail store, entices you with a low price to get you in the door and ready to buy, but once the purchaser goes to buy you find that you need to upgrade something to buy it, or the product is no longer in stock and the alternative product is much more expensive. The online version of this is much the same and thus I will continue explaining my experience. After the purchase was made I called the number in the e-mail to “confirm” my order. After being asked for the numbers on my CC card, my address, etc I was asked if I needed a battery for an additional $100. I asked if the G10 was a retail unit and was told yes. As such I said it should come with a battery and was told it did not. Thats most interesting, Lets take a closer look. A quick check of their website shows that the tab “Items Included” is both blank and non-functional. This is so that the store can claim whatever they want when they say that something is or is not included. I told them to just ship me the camera as it was, for if it is a retail box then it should come with the battery. I also asked for a tracking number for the camera so I knew when to expect it and was told that my tracking info would be included in an e-mail that would follow. Two days went by without a “followup” e-mail so I called again and was told this time that the camera was backordered (here comes the switch part) but that an alternate product the Panasonic DMC-FZ28K was in stock and available, the DMC-FZ28K is a 10MP camera compared to the 14.7MP (15MP) of the Canon and it is also not nearly as professional a product. 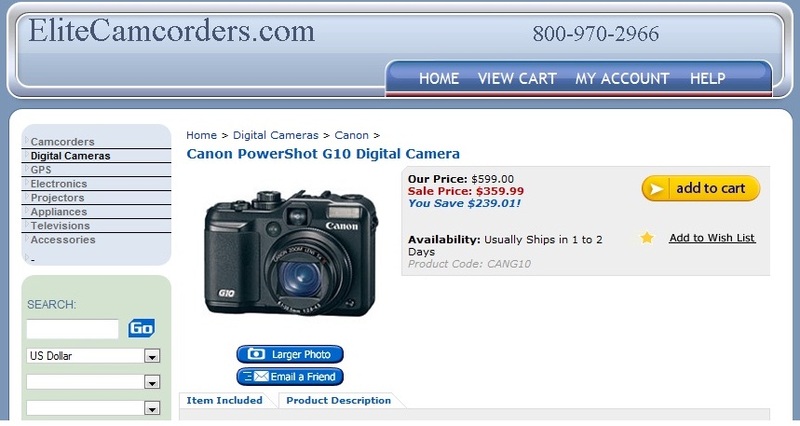 EliteCamcorders lists the DMC-FZ28K for $399 making it $40 more expensive than the Canon G10, but wait theres more. I was then informed that the only DMC-FZ28K left was one that was included with their “Deluxe” bundle for $699 and that he (the sales rep) could process my order immediately if I liked. At this point I was sure that any regular customer of theirs would need vaseline for their ordering experience and politely declined. At this point I was told the backorder of the G10 would be 3-4 weeks if not longer and I promptly asked them to cancel my order. The sales rep quickly put me on hold for five minutes and when he came back he told me his manager authorized him to split up the “deluxe” package and sell me just the camera for the regular price. I again politely turned the offer down and asked him again to cancel my order at which point I was told “Yeah, Fine…” as he hung up on me. A. The G10 was now back in stock. B. The site is trying even harder to entice peoplel to buy then switch the product on them, or force additional purchases. I called the 800 number to find out. After being put on hold for 30 minutes the sales person who told me he was transferring me to another department picked up the phone again, but this time answered as the customer service department. . . Interesting. I inquired as to the status of the G10 and was told it was in stock and ready to sell. I then informed them of my previous cancelled order and was put on hold while the salesman checked his stock (didn’t he just do that?). When he returned he apologized for being wrong and told me the G10 was indeed out of stock. I asked about the lowered price and was told that they didn’t control pricing, instead the warehouse controlled pricing. You’re kidding right? I laughed and hung up as my BS meter just went nuke. Reality check here: Why would any legitimate retailer reduce the price on a product that is not even in stock? The answer: They wouldn’t, there would be no need. A search on their phone number 800-970-2966 shows that this number was used by XtremeCameras.com a now closed site. It seems that EliteCamcorders has gone through some transformations in their efforts to continue doing business as the company used to also be known as Xtreme Cameras (XtremeCameras.com), U Buy Digital (UBuyDigital.com), The Camera Professionals (TheCameraProfessionals.com), HD Camera World (HDCameraWorld.com). Are you starting to get the picture now? Ultimately I did not receive anything from EliteCamcorders and I took the additional proactive step to notify my credit card company about the transaction and that any charges from their company were to be denied. I cannot stress enough the apparant illegality of their actions in this attempted Bair and Switch and cannot recommend that any ever do business with them. 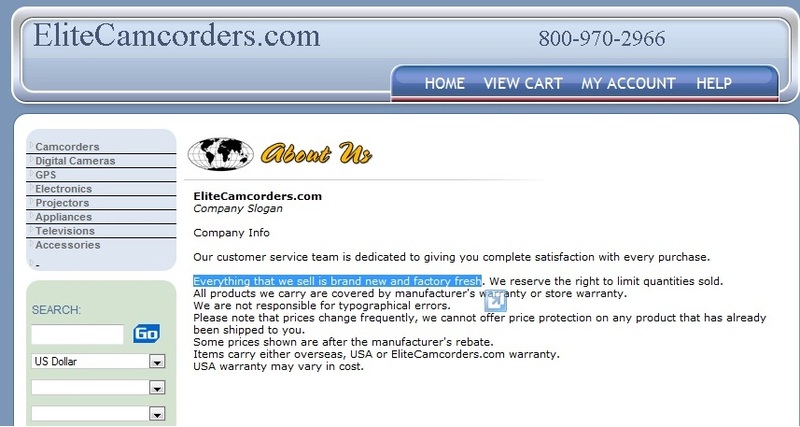 I am not suggesting that EliteCamcorders is indeed a business engaged in illegal activities, all I am saying is that the business practices are questionable and that you should be aware of these tactics used to sell you merchandise that you probably don’t need. That’s if of course you receive them. Keep your eyes open, do simple searches, and knowing what the signs of this classic fraud are will keep you from making these mistakes. Back in August we first reported this website and these tactics to you. Recently we decided to take a fresh look at Elite Camcorders and see if their attitudes towards their customers had changed for the better. We decided to phone in an order for the same digital camera to see what the outcome would be. A phone order was chosen so we could actually speak to someone and make our intentions clear. We asked about the G10 as well as several other cameras. This time we set a deadline for the order to arrive in order to convey a sense of urgency. We then specifically asked if the G10 was in stock and if the sales clerk could check. A positive answer of YES was given. As a change to our original reporting of their tactics, we were informed that these camera’s were imports not from the US markets and as such did not carry a warranty (Grey Market Electronics are illegal BTW) and if we wanted to purchase an aftermarket warranty. When we replied no to all of the additional accessories, batteries, memory cards, we were able to put the order through. We gave the order a little more than a week for our deadline and were informed that express shipping would get the G10 to us at that deadline at a pricetag of $53. (Red Flag Overcharge Alert Anyone!) We agreed to the charge just to see if Elite Camcorders would be pleased with getting their profit margin on the shipping and actually send us the camera. When we inquired about a confirmation e-mail we were told we would receive the e-mail by no later than 9am the next morning. Needless to say we were not very surprised when 9AM came and went with no e-mail confirmation. Picking up the phone we called the customer service number and spoke to a nice woman who had some trouble even finding our order. When she did find it we were informed that the G10 was on back order. (Sound familiar?) We immediately informed them of our initial request if the G10 was in stock and were told yes. She had no response to this and then simply asked if we wanted to wait (apparently till doomsday) or cancel the order. When we asked to speak to a supervisor we were given voicemail. We left a message and have not heard from Elite Camcorders since. It seems that the state of New York tolerates these businesses for the income they generate at the expense of consumers all over the US. It is unfortunate that Elite Camcorders has been allowed to continue to operate using these deceitful and questionable business practices. We would have very much liked to turn our buyer alert into a positive note for Elite Camcorders but we cannot do so. Instead quite the contrary, we continue to suggest that this company be avoided like the plague. Finally we want you to keep your cash in your wallets and purses instead of in the hands of businesses who will overcharge and try to scam you. Make sure you shop only at online retailers with listings on www.resellerratings.com or simply stick to well known sites with a reputation like Newegg. You may pay more, but you will get what you paid for and you won’t get the run around. Hi. Good reporting. I should point out, though, that that this is hardly news. Stores like these have been operating for 40+ years, first in the NYC area and now on the Web. I co-wrote an expose of them 7 years ago (see http://www.pcworld.com/article/107855/camera_confidential.html); one of the stores we looked at back then was UBuyDigital.com. There are dozens of other stores just like them operating under hundreds of different names. they’ve also branched out into bogus ‘price comparison’ sites that drive unwitting customers toward their commerce sites — see http://blogs.computerworld.com/node/12851/print. It still all boils down to truisms: buyer beware, and deals too good to be true generally are. I almost fell victim to this when I was buying my Canon Rebel XTi, It was some company in new york and the guy was trying to sell me an extra lense with it that was “Superior in quality” but when I looked it up online there was no mention of the “superior” model of the lense, just a subpar model. Glad I was next to my computer during that phonecall. If the NewEgg price is being beaten by that much I would imediatly smell a Rat as they are not the cheapest but they are always fair. This also happens with cheap prices on software. A deeply discounted purchase of a new version of, say Photoshop will often get you a really old version with a few upgrade disks which may or may not work with your newer OS.